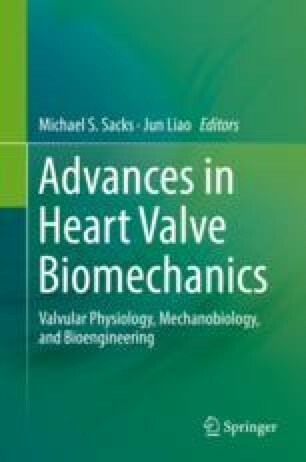 Little is known about how normal valvular tissues grow and remodel in response to altered loading. In the present work, we used the pregnancy state to represent a non-pathological cardiac volume overload that distends the mitral valve (MV), utilizing both extant and new experimental data and a modified form of our MV structural constitutive model. We determined that there was an initial period of permanent set-like deformation where no remodelling occurs, followed by a remodelling phase which resulted in near-complete restoration of homeostatic tissue-level behaviour. In addition, we observed that changes in the underlying MV interstitial cell (MVIC) geometry closely paralleled the tissue-level remodelling events, undergoing an initial passive perturbation followed by a gradual recovery to the pre-pregnant state. Collectively, these results suggest that valvular remodelling is actively mediated by average MVIC deformations (i.e. not cycle to cycle, but over a period of weeks). This material is based upon work supported by the National Institutes of Health grant no. R01-HL119297 to MSS, the National Science Foundation grant no. DGE-1610403 to BVR, an American Heart Association Scientist Development Grant Award (16SDG27760143) to CHL, and a Natural Sciences and Engineering Research Council of Canada Discovery Grant to SMW.